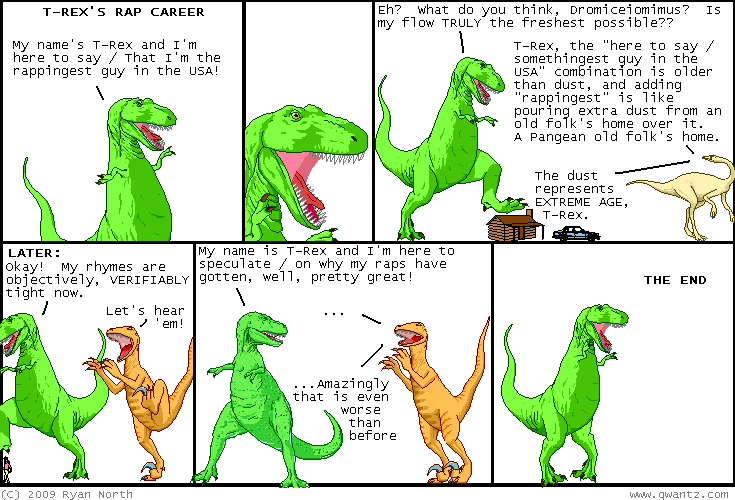 Dinosaur Comics - July 8th, 2009 - awesome fun times! July 8th, 2009: Guys Goats has a book out now! Infinite Typewriters. Goats has been online since FOREVER (where 12 years ago equals "forever", basically!) and it's amazing, because you can pick up this book and not be lost in all that continuity! The first few pages of comics give you all the characters and background you need. Goats is kind of CRAZY, in that there's a joke in every comic BUT also this iron-clad continuity BUT ALSO crazy stuff happens all the time. It's almost like a child telling a story, where one thing flows into another, except it all escalates and makes sense and you start at a pub and end up in this universe-spanning epic and it never seems like things have changed. It's pretty rad you guys! One year ago today: i would really like to read an entire series of books by various famous authors, all called "My Tiring Day". Imagine Alan Moore's "My Tiring Day" next to Nick Hornby's and Gabriel Garcia Marquez's installments! amazing.